Martin Hamm: minister and farmer; born 29 June 1899 in Blumenhof, Borozenko Mennonite Settlement, South Russia, to Martin M. Hamm (1 February 1869, Meerfeld, Kherson, South Russia - 1 December 1919, Schönau, Zagradovka Mennonite Settlement, South Russia) and Helena (Penner) Hamm (3 November 1871, Schönhorst, Chortitza Mennonite Settlement, South Russia - 30 November 1938, Blumenhof, Borozenko Mennonite Settlement, South Russia). He was the third of nine children in the family. On 28 August 1921, he married Anna Warkentin (20 November 1896, Schönau, Zagradovka, South Russia - 12 July 1953, Chilliwack, British Columbia, Canada) in Schönau, Zagradovka, South Russia. She was the daughter of Johann A. Warkentin (1858-1943) and Katharina (Voth) Warkentin (1869-1915). The couple had three children before immigrating to Canada in 1926 and another seven children in the years following their arrival: Lena, Mary, John, Martin, Anne, Frank, Peter, Cornelius, Walter, and Margaret. An eleventh child, Jacob, died in infancy. They settled in Peace River, Alberta, where Martin worked as a farmer and a minister, and in 1945, they moved to Chilliwack, British Columbia. Anna died in July 1953, and Martin married Elisabeth (Neufeld) Willms (1 May 1904, Kronsthal, Chortitza, South Russia - 22 May 1982, Winnipeg, Manitoba, Canada) on 19 April 1954 in Winnipeg, Manitoba, Canada, a widow with four children. They settled in Winnipeg, Manitoba, where Martin died on 6 February 1982. Martin Hamm grew up with his family and other Mennonites in the settlements of Borozenko and Zagradovka, first in Blumenhof and then in Schönau. He received his basic education in his village and graduated from the Kommerzschule (school of commerce) in Alexanderkrone. Although he hoped to continue his studies abroad, his plans were interrupted when his father, a minister, was killed by bandits. Instead of leaving, he stayed with his family and became a self-taught teacher, a profession he was unable to continue in Canada. Martin was baptized after his conversion at age 17 and joined the Evangelical Mennonite Brethren church in his village. On 28 August 1921, Martin married Anna Warkentin in Schönau and established a home there. Together with their three eldest children and other relatives, Martin and Anna Hamm left for Canada on 13 April 1926 and landed in St. John, New Brunswick, before moving west and settling in Peace River, a settlement in northern Alberta. Unable to work as a teacher in Canada, he took up farming instead. At the same time, he also worked as the minister of the La Glace Mennonite Brethren Church in the nearby town of La Glace. The family grew during these years, with seven more children being born to Martin and Anna in Alberta. 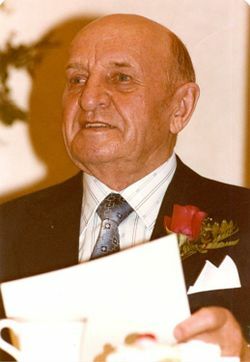 In 1945, Martin Hamm and his family moved to Chilliwack, British Columbia, where Martin and Anna became charter members of the Chilliwack Mennonite Brethren Church. Anna died in July 1953, and on 19 April 1954, Martin married Elizabeth (Neufeld) Wilms, a widow with four children, in Winnipeg, Manitoba. They settled in Winnipeg, where they joined the Elmwood Mennonite Brethren Church. In 1979, they celebrated their silver anniversary in that church. After his retirement, Martin worked half-time as a caretaker but also pursued many hobbies, as well as spending time with family and friends. In the 1970s, he wrote many articles for the German periodical, Die Mennonitische Rundschau, on the Mennonite World Conference and other topics. He died suddenly on 6 February 1982 in Winnipeg. The funeral was at the Elmwood Mennonite Brethren Church on 11 February. Martin Hamm was a dedicated and adaptable teacher, minister, and farmer who used his gifts to serve his family and the people of his community, both in his home country and in Canada. Known for his deep faith and cheerful disposition, he made many friends during his lifetime and was an example of commitment to his faith and of flexibility in adapting to whatever circumstances he encountered. Canadian Conference of Mennonite Brethren Churches. “Hamm, Martin.” http://www.mbconf.ca/home/products_and_services/resources/published_genealogies/personal_papers/hamm_martin/ (Accessed 24 February 2010). Hamm, Martin. Aus der alten in die neue Heimat, Lebensgeschichte eines schlichten Mennoniten. Winnipeg: Christian Press, 1971. Mennonite Brethren Herald (12 Mar. 1982): 30. Mennonitische Rundschau (10 März 1982): 26. Huebert, Susan. "Hamm, Martin (1899-1982)." Global Anabaptist Mennonite Encyclopedia Online. March 2010. Web. 19 Apr 2019. http://gameo.org/index.php?title=Hamm,_Martin_(1899-1982)&oldid=132702. Huebert, Susan. (March 2010). Hamm, Martin (1899-1982). Global Anabaptist Mennonite Encyclopedia Online. Retrieved 19 April 2019, from http://gameo.org/index.php?title=Hamm,_Martin_(1899-1982)&oldid=132702. This page was last modified on 8 September 2015, at 18:22.